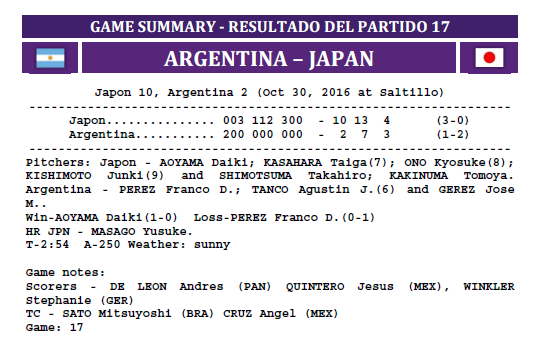 Argentina (1-2) opened the scoring with two runs in the first before Japan (3-0) responded with 10 unanswered runs en route to a 10-2 victory. Yusuke Masago’s 2-run home run highlighted a 3-run third inning for Japan who received a 2-for-5 two RBI performance off the hot bat of Kengo Takeda. Japan starting pitcher Daiki Aoyama worked six innings without allowing an earned run and struck out six batters to get the win. Argentina’s Franco Daniel Perez took the loss.